Happy Easter everyone. 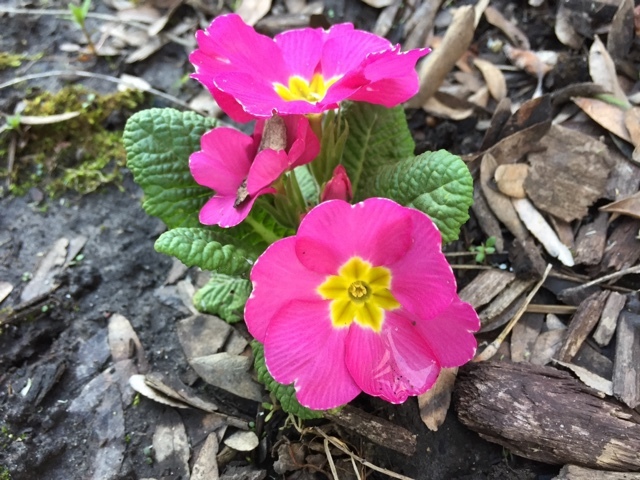 Steve and I are in our second spring since our move back to Grand Rapids, and this has been the first burst of color in our little garden two years in a row. The lovely primrose - ahhhhhhh. Our day began misty, windy and overcast and is winding down with glorious sunshine, lovely breezes and no humidity. We'll take it, thank you very much. We spent the afternoon with the Galloway and TenHave clan for a delicious Easter dinner and good conversation and companionship. Thanks Scott and Jen - you're the best! Of course I simply had to make dessert for the gathering, and what better flavor to choose than something lusciously LEMON. 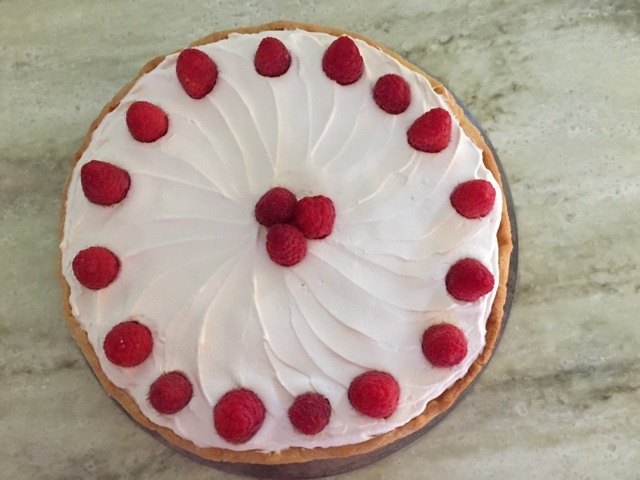 I turned to that tried and true (and now my favorite tarte au citron) recipe from Jacques Genin, topping it with a thin layer of crème Chantilly and some fresh raspberries. 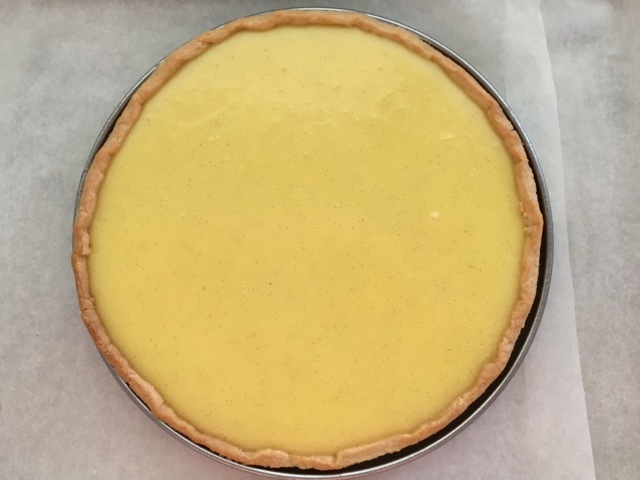 A good lemon tart is one of THE best things in the pastry world à mon avis, but I wanted to throw something else into the mix for the holiday meal. 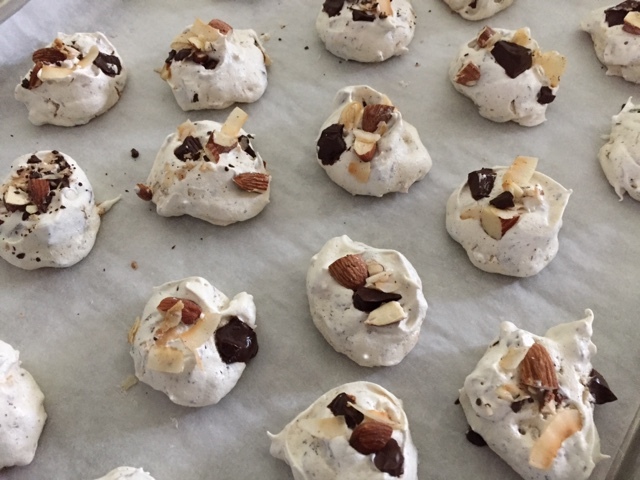 I'd been thinking about coconut and chocolate and ended up following Alice Medrich's coconut chocolate meringue recipe in her book "Flavor Flours" (a recent and exciting discovery for me). 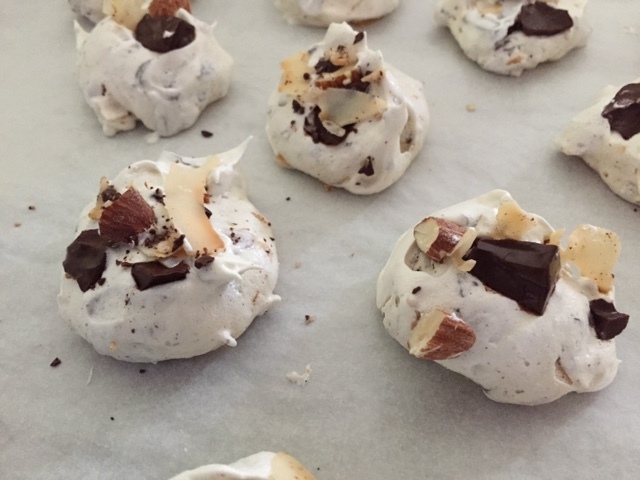 What better way to use up some of those egg whites I had sitting in the fridge. 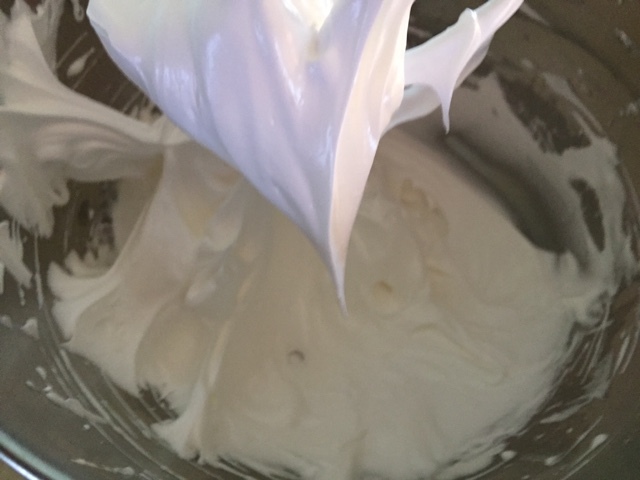 Make a basic meringue, taking it to stiff peaks. 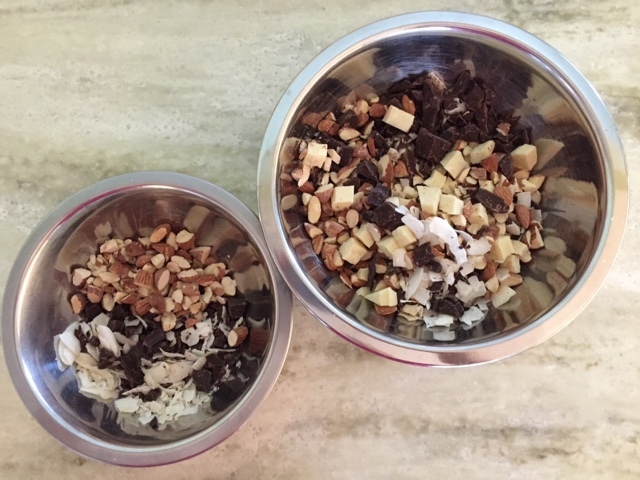 Fold in a delightful mixture of chopped dark and white chocolate, coarsely chopped roasted, lightly salted almonds and coconut chips (the smaller bowl below is for sprinkling on the top of the scooped meringues). 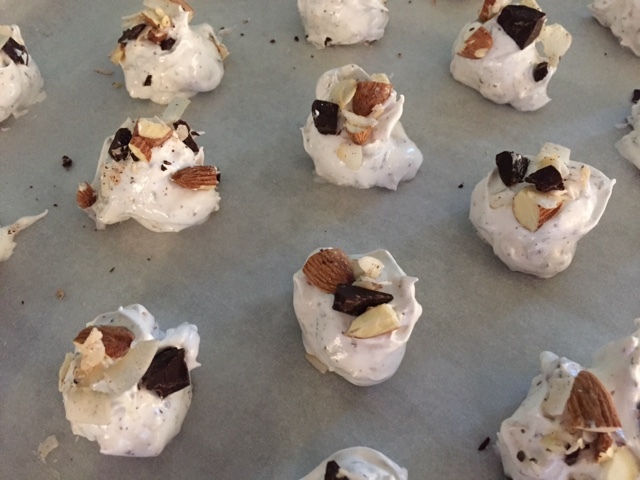 Portion out generous tablespoons of meringue mixture onto parchment lined sheets, then sprinkle additional chocolate/nut/coconut mix on top. Bake at 200ºF for 1.5 hours, then turn oven off and let cool completely. 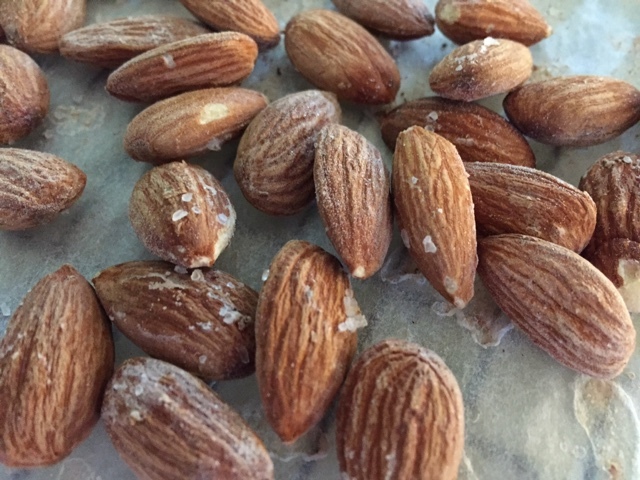 Crispy, crunchy, nutty with almonds and coconut, chocolate chunks - what more does one need in a bite size treat? These are downright tasty. I declare this a winning dessert day - yay! But before I go, here's one final note. 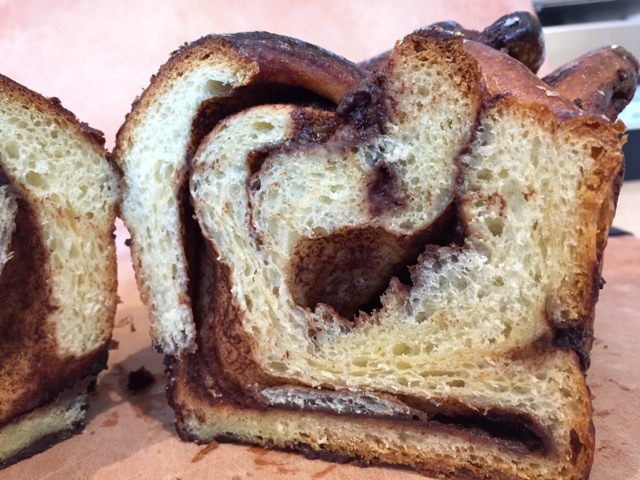 Just when you thought you'd heard the end of the whole babka thing, I'll finish up with one more experience with that oh-so-intriguing subject. 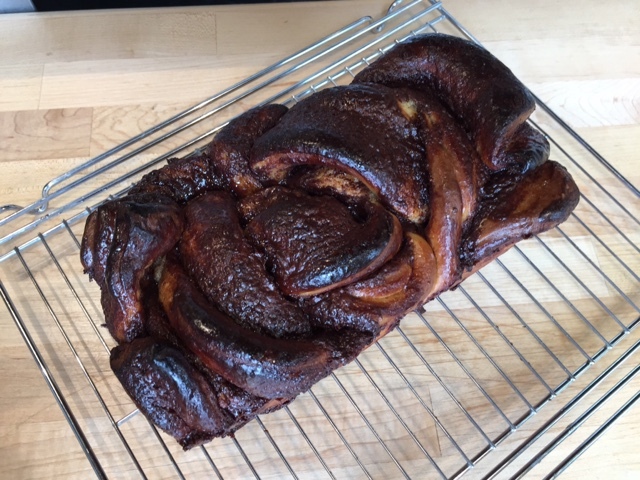 I baked one more babka the other day as part of a trial for an Easter class I was preparing to teach at the Breton Sur La Table here in Grand Rapids. The process went well, the dough felt great, the plaits looked pretty good (in spite of a bit of messiness with the chocolate filling), and it went into the pan without much of a hitch. It baked a bit longer than I expected but came out a deep golden brown and smelling heavenly. 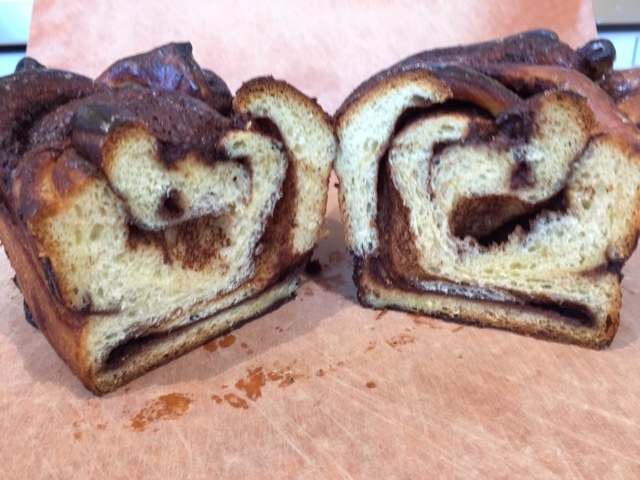 The swirls were okey-dokey when sliced too. And you know what? Delicious. 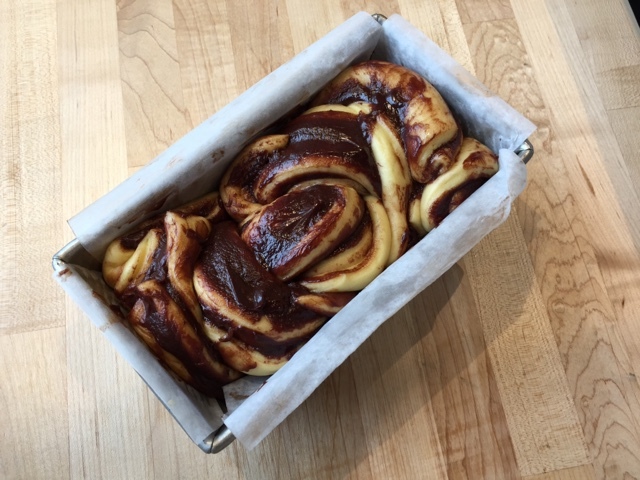 I promise that's it for this year's babka session. Enough. Happy spring everyone and thanks for reading "Baking with The French Tarte". I appreciate it more than you'll ever know.